It won’t be published until 2018, but I’ve already put a lot of work into a forthcoming book for the National Library of Australia to be titled Australia’s Islands. There are an awful lot of them, more than 8000, more islands in fact than there are in the Caribbean. There’s even one with my name on it, click here to find me landing on Wheeler Island in northern Queensland. Any study of Australia’s islands is bound to bump into Matthew Flinders who circumnavigated Australia in 1802-1803, named numerous features around the continent, confirmed that Tasmania was a separate island from the mainland and is credited with giving Australia its name. Previously it was everything from New Holland or Terra Australis to the Great South Land or even the Colony of New South Wales. Sadly on returning to England he ended up imprisoned on the French island of Mauritius for over six years and when he arrived back he only lived a few more years before dying in 1814, aged only 40. He’d been married to Ann Chappelle only shortly before his last voyage to Australia and they would end up separated for nearly 10 years. Flinders died only a day after the publication of his book A Voyage to Terra Australis. 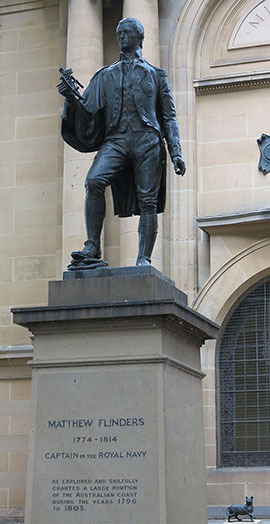 ◄ Only Queen Victoria has more statues in Australia than Matthew Flinders, this one is outside the State Library of NSW in Sydney. But what’s that in the bottom right corner of the photograph, perched on the library windowsill? 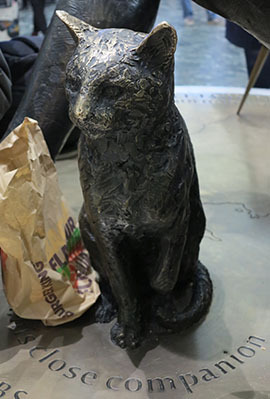 ▲ Yes, it’s Flinders’ faithful cat Trim who travelled out to Australia with Flinders and then circumnavigated the continent. 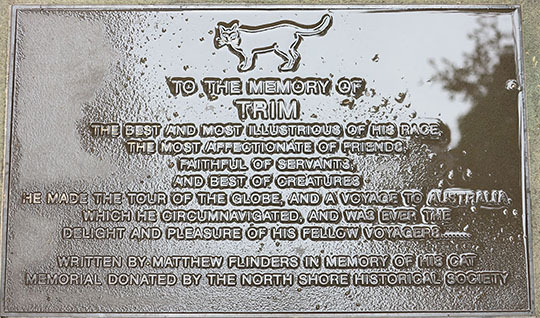 ▲ A plaque recounts Trim’s attributes although sadly Trim disappeared during Flinders’ Mauritius imprisonment. ◄. More recently a statue of Flinders, accompanied once again by Trim, was added to the concourse at Euston Station in central London. Flinders’ grave has been lost, it probably disappeared when the station was built over the graveyard of St James. Flinders may lie beneath platform 15. 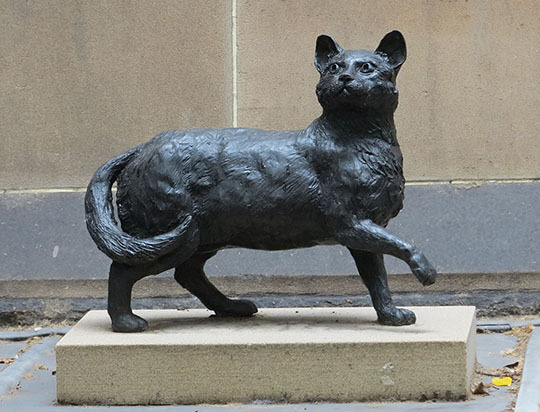 Unfortunately Flinders and Trim at Euston are on a plinth which is a popular perching spot for commuters. At rush hour Trim can be surrounded by discarded coffee cups and fast food wrappers.